Bhraman Somogro is a popular travel story of Humayun Ahamed. There are many travel stories included on this tour book by Humayun Ahmed. All of the stories here is related to the travel story and event. 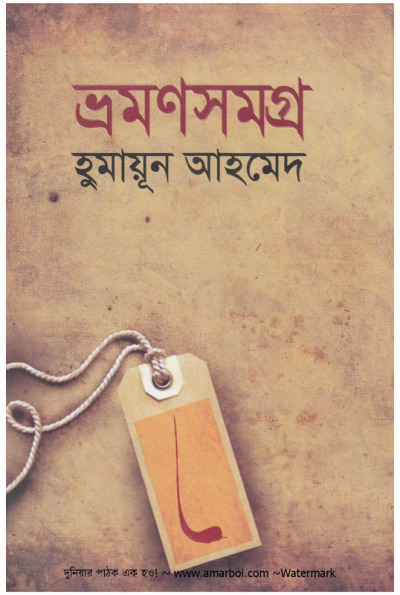 These stories were rewritten byHumayuna Ahamed and he is a popular writer in Bangladesh. Humayun Ahamed loved traveling. When he traveled he wanted to company his family member of bosom friend. He has been traveling many places from home and abroad. A few of this travel story has written of his six travel related books and these are Payer Tolay Khorom, Raboner Deshe Ami Abong Amra, Dekha Na Dekha, Hotel Graver In, May Flower and Jhoshona Brikkher Deshe. Humayun Ahamed is a one kind of writer who has the ability of writing astonish thing of the general thing. The travel story is more popular like the novel and stores to his audience. If you are greatly fond of Humayun Ahmed writing, then you may like his traveling adventures too. However, to get downloaded this book, you are need to click here!